Starlight have developed a cost effective pre-terminated cabling system called OPAL™ (Optical Pre-Assembled Link) which is completely based around standard networking products. The system allows a fibre optic network to be installed in a fraction of the time taken by conventional on-site direct termination or fusion splicing. It requires no special installation skills or equipment, and can therefore be installed by non-specialist personnel, vastly reducing the installation cost. The system consists of standard internal / external tight buffered distribution cable, which is supplied in specific lengths for each cable run in an installation. This cable is available in multimode or singlemode with fibre counts of 4, 8, 12, 16 or 24. The cable is factory prepared in our in-house facility with a gland on each end which is epoxy bonded onto the Kevlar Strain Relief Yarn in the cable. The secondary coated fibres are terminated with either ST, SC, LC or FC-PC connectors which are fully tested and certified under our quality system. This ensures that the quality of the complete cable assembly is guaranteed before shipping to site. 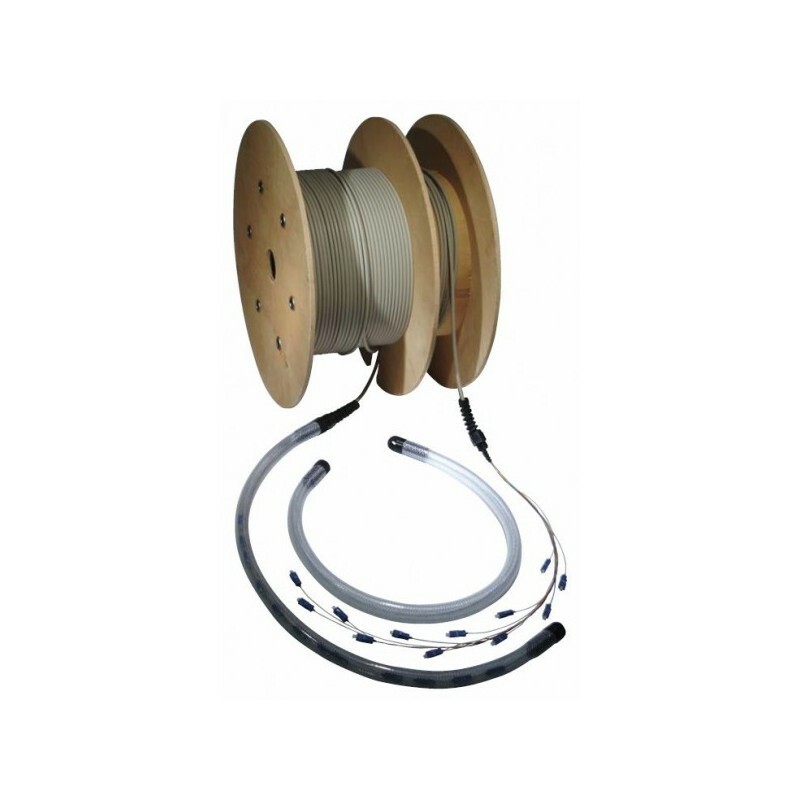 A specially developed termination protection sleeve is fitted to each end of the cable assembly to protect the connectors during shipping and installation. This sleeve has a small diameter and is flexible, lightweight and extremely rugged. The protection sleeve connects onto the epoxy bonded cable gland and can withstand the high tensile loads applied when pulling cables through ducts. A pulling eye is incorporated to allow the attachment of a draw cable. After cable installation, the protection sleeves are removed and the connectors are threaded through the gland hole of any cable management enclosure. A gland nut is used to secure the cable gland in place. Then the connectors are simply connected to the adaptors inside the enclosure to complete the installation. If you require the Pre-term to be made from Loose Tube Cable, specify this in the comments box at checkout.